This is an offset boring head (half finished). It is 1 1/2 inches in diameter and made of steel. 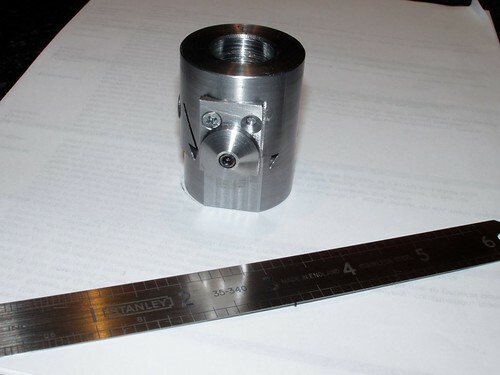 It has a 3/4-16 thread and register to fit the Taig spindle, and a 40 TPI feed screw. I still need to drill and bore the bottom half for the boring bits and graduate the feed screw dial. You can see a screw missing from the keep plate on the front - I broke a tap behind the hole and have since repaired it by grinding and driving out the remains of the tap and plugging the hole with a piece of stock press fit into the body. This will be drilled and tapped later on.